For the past 11 years I have served in the United States Marine Corps and deployed to Iraq during Operation Iraqi Freedom. 7 years ago I met my best friend Sunny and asked her to be my wife. Before trying CrossFit I was probably one of the biggest skeptics of the program. I was dedicated to my Monday, Wednesday, Friday “globo-gym” routine. There was no way to convince me that I could get better results from a 20 minute WOD than an I could with an hour and a half of doing curls and bench press. I honestly thought of CrossFit as the latest fad that would fade like all the rest. Needless to say it only took a week at CrossFit Harrisburg and a little lady named FRAN to realize how wrong I was. With one workout I was hooked. The challenge that every WOD presents keeps me coming back for more. The friendships made through CrossFit are truly unique. Like-minded people pushing their minds and bodies to the limit with one common goal of fitness is something that cannot be found anywhere but the box. My wife encouraged me to become a coach and I’m glad she did. I love being a part of someone’s progress with CrossFit. Nothing makes me happier than to know I helped push someone beyond what they thought was his or her limit. I am a stickler on form and a fan of the “NO REP”. Success with CrossFit is based on a strong foundation of good form. Cheat on form and your only cheating yourself. 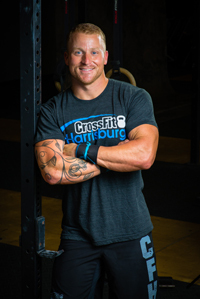 I owe credit for the positive changes in my life over the past year to Frankie, Josh and the CrossFit Harrisburg family.